There is a darkness. Upper entrance to the 54th Street steps at Camelia Street, Stanton Heights. An unusually iridescent quality to the daylight–the result of diffuse, cloud-filtered sunbeams’ gentle descent to Earth. That, paired with recent showers and high spring reawakening, resulted in a glorious array of patchwork greens popping from every direction. Bright yellow-greens from first leaves and tangled weeds climbing through last year’s dead growth. Deep low greens darken ivy shadows and taller members’ undergrowth. Add one storybook passageway–literally full of twists and turns, hoots and birdsongs–and you’ve got a recipe for magic. Zig zag wanderer: right-angle turns at the top of the 54th Street steps. The 54th Street steps are a stretch that one can only assume is on the endangered species list. Several pedestrian walkways link the residential neighborhood of Stanton Heights (above) to 10th Ward/Upper Lawrenceville (below). 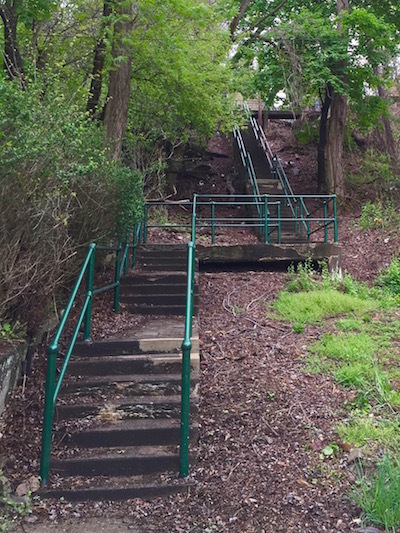 At one time, there must have been significant demand for this kind of infrastructure, but with (most of) Lawrenceville’s big industry jobs long gone and automobile ownership more rule than exception, it’s hard to imagine many people needing to use these particular steps anymore. This blogger didn’t encounter a single other human on his recent visit. The long middle section of the 54th Street steps including wooden replacement handrail. And that’s a shame…sort of. 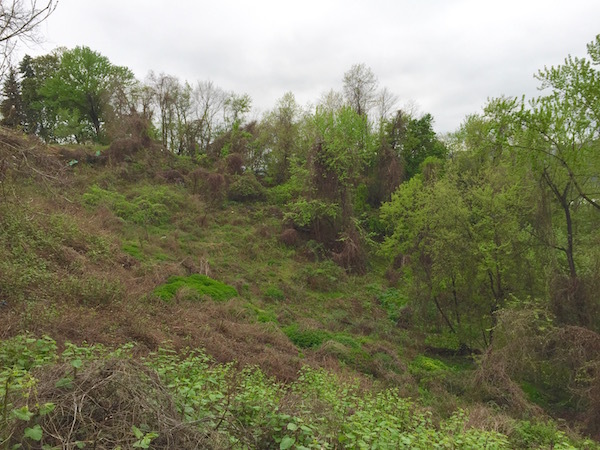 Pittsburgh has its share of great parks, trails, green spaces, etc. But it never ceases to amaze how simply walking around city neighborhoods offers so many everyday opportunities for nature, tranquility, solitude–you name it. The 54th Street steps, as well as others up this way, are a prime example. 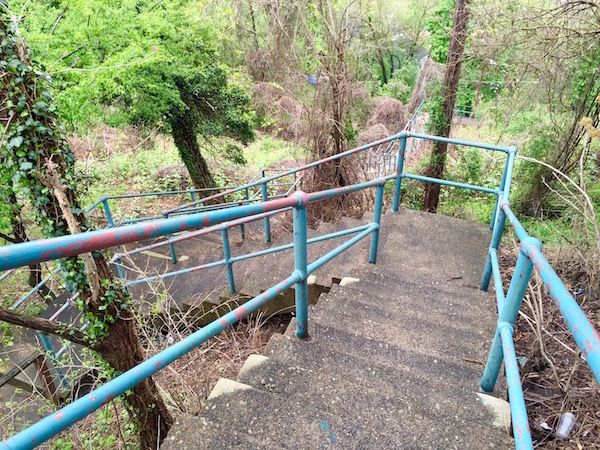 The parks may have a greater bounty of trees, flowers, birds, and chipmunks, but they don’t supply the crazy catwalk gangways and cut-into-hillside stair climbs. You won’t see the same ghostly foundations of long-gone step-accessible (only) houses or burnt offerings to witchcraft. 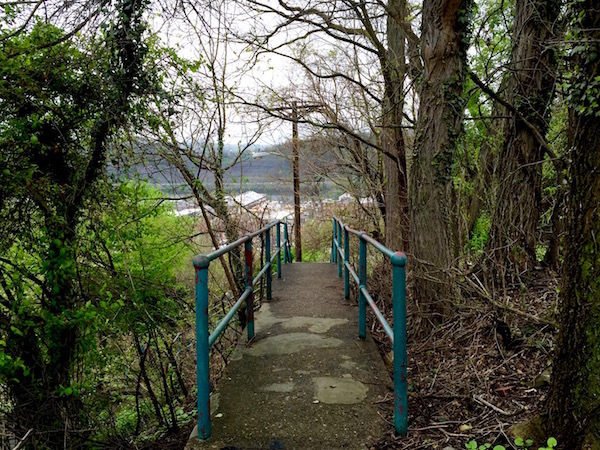 The entire length of 54th provides commanding bird’s eye views of Upper Lawrenceville and across the river to Millvale. The river trails are often crowded with Sunday cause-marchers and lollygagging strollers that can test the through-rider’s patience. The presence of humanity is no such problem up here. This is city living. View from the 54th Street steps. The 54th Street steps are in quite good shape overall. There is some cracking to the concrete and there’s been obvious repair work including a fixed-up section of felled handrail with a jerry-rigged wooden replacement. But the treads are all sound and there’s no point where they feel like they’re falling apart. Any regular step-hiker will tell you this is no small achievement. This is all pretty remarkable given the length and complexity of the operation. Fifty-fourth Street is definitely not the longest set of steps in the city (that’s the unbelievable Rising Main Way on the North Side), but with maybe 200 stairs* it’s probably up there. When you factor in the six right-angle turns and long flat stretches, it’s really a hidden jewel a in the city’s step crown. Get out there and try it on for size. 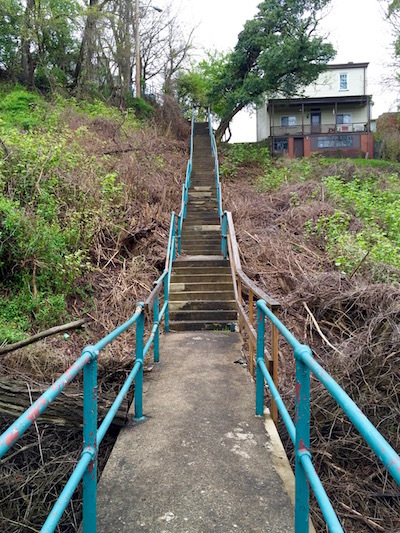 Lower end of the 54th Street steps at Wickliff Street, Lawrenceville. * Just guessing here–we didn’t count. I spent many great memories growing up. These steps took me from church on Carnegie back home on 56th St.. I could write a book on every set of steps I’ve used from Stanton HTS to Morningside, Stanton Ave, so many…. Brings a tear to my eye to see this article today. I just sold my childhood home on 56th for my mother on May 4th, 2016. Can’t even count how many times I’ve walked those steps.It certainly brings back memories. What a fitting goodbye. Thank you!